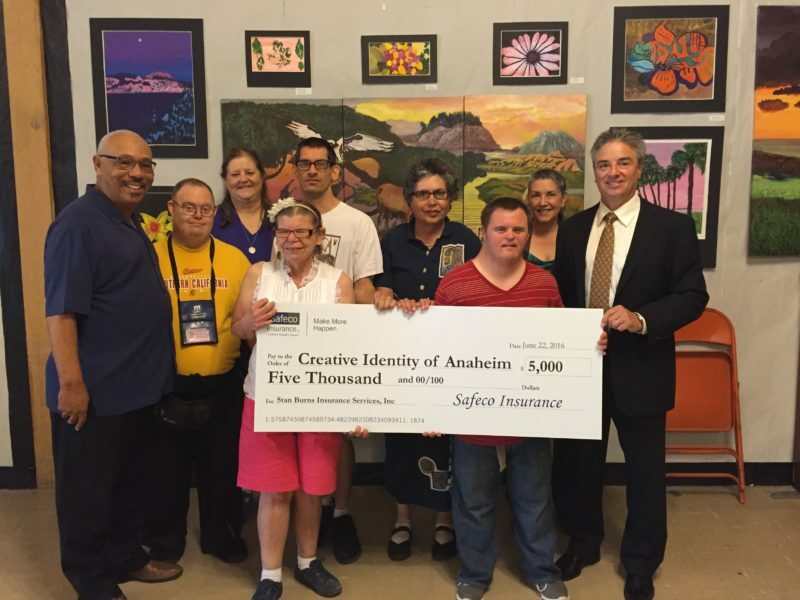 $5,000 donation to Creative Identity of Anaheim !!!! Safeco Insurance Company and Stan Burns Insurance worked together to present the "Make More Happen" award to Creative Identity of Anaheim. Creative Identity of Anaheim is an adult day-care program for developmentally disabled adults. This non-profit organization provides music and art therapy to over 40 adults (clients) in Anaheim and Laguna Beach, CA . Pictured here are Executive Director and Founder, George Gilliam (L) with Clients in the middle and Tom Burns (R), as the "Big Bucks" are accepted by the group! You can find out more, and why we support this fine organization by clicking here. Our staff of 10 are all licensed insurance agents. This is great for you because if you are like most consumers, you want expertise and reliability. At Stan Burns Insurance, you can trust the policy you purchase comes with award-winning Customer Service. Our Sales Agents and Customer Service Reps have completed multiple training courses with emphasis on attaining Customer Astonishment. We specialize in both Commercial Lines (General Liability, Property, Workers Compensation, Business Auto) and Personal Lines (Auto, Home, Renters, Umbrella) policies. In addition we have a dedicated department for Life, Dental, and Employee Benefits. Our portfolio of 70+carriers has been selected from the over 1,500+ insurance companies in the USA because of their Financial Strength and Stability, Claims Service, and extremely competitive rates. There is a good reason we have been in business for 50+ years! Our clients say it best…. “I have been with Stan Burns Insurance services for well over 10 Years. Their customer service is impeccable. Anytime I needed anything, their response time was almost instant. I also appreciate the courtesy calls reminding me of payments due.